Beans are one of the foods I really crave. 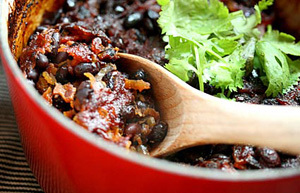 No matter if it’s black bean soup with tons of fresh lime, refried beans, chili or summer barbecues – I make a beeline to the baked beans! I have a passion for Moros y Cristianos, gorgeous black beans and rice cooked with green peppers, fresh cilantro, savory spices and a little ham. I treat myself to this whenever I visit the very authentic Cuban restaurant, La Isla, in Hoboken, N.J. My version of black baked beans is a nod to some of the flavors you’ll find in a plate of their moros, and a recipe that published on AOL’s Slashfood. For the healthy cook who wants something rich in flavor, beans are an excellent choice, since they are loaded with all sorts of nutrients such as folate and boast a mineral content with high levels of iron and manganese. In addition to their creamy texture, beans are top on my list because they happen to also be high in protein and very high in soluble fiber, which is beneficial for everything from controlling diabetes to preventing colon cancer.